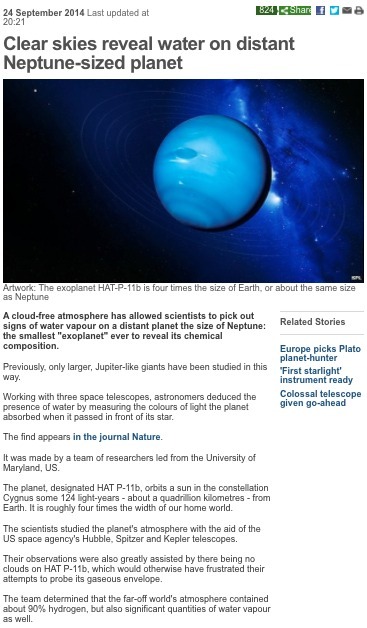 This story caught my attention last week – the discovery of water on an extrasolar planet which is as Neptune-sized. The exoplanet in question – HAT-P-11b, was discovered by the telescope Kepler in 2009 using the “transit method”. You can read more about that method here. The star itself, HAT-P-11, is about 122 light years away in the constellation Cygnus. The planet has been determined to be about the size of Neptune, which means it is about five times the size of the Earth. Such relatively small planets can, to date, really only be found by the transit method, as the doppler shift method which discovered the first several hundred exoplanets is not currently sensitive enough to detect planets as small as Neptune. Astronomers have discovered water in the atmosphere of a Neptune-sized exoplanet for the first time. A team has used the Hubble Space Telescope to observe the absorption spectrum produced as HAT-P-11b passes in front of its parent star. The light from the star, as it passes through the gases in the atmosphere of the planet, will have certain wavelengths removed, this is the principle behind the absorption spectrum that I explained here. The scientists have found that wavelengths corresponding to water vapour have been removed from the star’s spectrum, showing that water vapour exists in HAT-P-11b’s atmosphere. This is tremendously exciting, as finding water is, with our current understanding, vital to finding life. This discovery shows that planets harbouring water are definitely out there, probably in their millions or billions. The next step will, hopefully, be finding water on a planet which is in the habitable zone, but this discovery is definitely a step in the right direction. I hope its not too tremendously exciting so that we forget whats going on back at the ranch. Unless we balance the books soon we may lose the power to gaze numbed and wide- eyed into infinity. There was a discussion on BBC TV on Sunday morning about whether we (human beings) should spend money on space when there are so many problems here on Earth. The viewers voted some 65% in favour of it not being a waste of money but a necessary part of being human. I did not see that one but my vote would have been earth- centred, so we can continue being human for a little longer. Science is a most potent and powerful force it urgently needs directing at the moment is is hijacked by the richest bidder. The question was put because this week is “International Space Week”, celebrated this week every year to coincide with the week that Sputnik was put into space in 1957. Also, with India having just sent its first space probe to Mars, it obviously raises the question of whether a country like India, with so many hundreds of millions living in poverty, should be spending some US$75 Million on a space probe. Science has great power which should be used to benifit all mankind. It also is reponsible for its inventions which can do harm as well as good. Consider the harm done by the internal combustion engine as well as its enormous potential for good. Politicians are not up to the job they mostly seek re- election. new antibiotics or solving the climate problem; these are very urgent problems. If you take a look at Safa Motesharrei’s mathmatical analyasis of civilisation breakdown you will see dangerous possibilities. The amount of money spent by the Indian Government on the probe to Mars is less than 1% of the India GDP. An analysis in the USA showed that, for every 1 US Dollar spent on NASA, 7 US Dollars was created in the economy. Successful weath creation does not always mean the system itself is morally defensible. Look at the enormous turnover in weapon manufacture, think of the numbers employed and the ongoing research. Its a success story without doubt, but will it ultimately lead to the well-being of humanity? Technology taken as a whole is hugely successful but has it done no damage? Sam Harris the well known atheist has boldly suggested in his book the moral landscape that we use well- being as a moral yardstick. I don’t think you can make any comparison between research and development of weapons and the humanity enriching exploration of space. That’s like comparing a gun manufacturer to a kidney dialysis machine manufacturer because they both work in precision machining. I take your point and I’m not against research that may prove benifical, but how much research is going on just for the sake of research. If everything in the garden was rosy then its time to play. The scientific turn of mind is enquiring regardless of use or consequences. In the same way the capatalist seeks profit as an end in its self. We are supposed to be moral beings but our world does not reflect that we are. When Faraday discovered the relationship between magnetism and electricity, leading to the invention of the electric motor and electric dynamo, he had no idea of any potential benefit. Likewise the work of JJ Thomson that led to the discovery of the electron. Nuclear magnetic resonance, used in hospitals throughout the World, came through particle physics research. As did the World Wide Web. Many tens of thousands are inspired to pursue scientific careers because of astronomy and space exploration. They may end up developing the blue LED (this year’s Nobel Prize in Physics), which has led to cheap and low power white LED lights, or they may end up making the next major medical breakthrough, but looking *outwards* and exploring the Universe is often what hooks them into science in the first place. Your enthusiastic faith in science is much greater than mine, but not all scientists agree with you some, like Martin Rees give us an even chance of surviving this century. The argument that we cannot tell what will be of use so research must be open- ended is a very dangerous one. We knew about ebola in 1973 now we decide to act is that looking ahead? Limits to growth is fifty years old is that looking ahead? The truth is we look far ahead when it suits us and bury our heads in the sand when it doesn’t. Not looking ahead and/or planning ahead is politics, not science. With regard to Ebola, we may have known about it since 1973 but this is the worst ever outbreak and the first time it has looked like potentially becoming a pandemic. Pouring resources into doing something to contain it and speed up the development of vaccines and treatments for it is a political and not a scientific decision. Politicians are mainly concerned with re- election. If they are to be of any use at all all groups must put pressure on them. Most groups go to politicians for money now is the time for world- leading scientists to look beyond money and their own concerns. I have nothing against science but we are in an unparalleled situation we cannot be complacent. We must all shout it is too late to expect others to shout for us.